I have a student who is saving her images in TIFF format but they are saving darker than the original image. Usually we can rectify this when we 'lock' the image settings (e.g. gain, offset, gamma) before saving. However, this does not seem to be working. Any suggestions? Have you tried my recommendations? 1. Set all Display Range (LUT) controls to defaults as they will not be transferred to other software. Specifically: Brightness=50, Contrast=50, Gamma=1, BL=0,WL=255. Switch off "Dynamic auto range" option in the Camera Control drop down. 2. If the image is dark, use camera setting to make it brighter: increase exposure time or gain. It will ensure that the image is captured in full dynamic range without LUT adjustments and will be displayed properly in other programs. 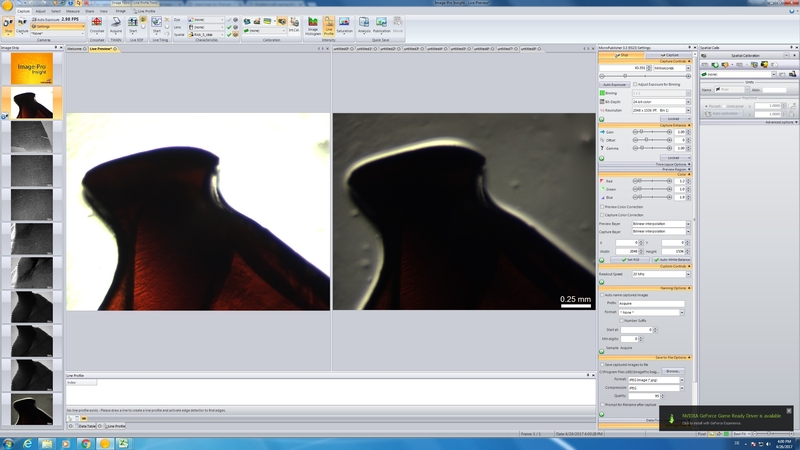 There are other parameters that can affect image brightness. It could be Black and White level (BL/WL), especially if you have 12 or 16 bit images. When you save visible image to TIFF file these parameters should also be saved. Please check these parameters after opening the image. You can always adjust display range clicking the Best-Fit button or opening images with "Open Best fit" option on. Thanks Yuri - we will give those a try now. We have locked all settings that can be locked when saving an image, and checked that the BL/WL parameters have been transferred to the saved images, yet the saved TIFF is still too dark. It looks okay when re-opened in ImagePro, but when opened in other programs it is too dark. It seems as though the problem only started yesterday after the student changed cameras. Would it be possible to access the computer remotely to take a look, or do you have any other suggestions? Many thanks in advance for your great advice. Ok, if you are talking about other software, then it might be related to Display Range TIFF tags, which other software doesn't read. In that case just try to make image to fit the whole dynamic range (e.g. increase exposure time) so it will be opened with full dynamic range in other soft. Is there any chance we could speak on the phone? My number is 01248 382611. We don't seem to be having any luck problem solving this one at our end. Alternatively, we can wait until David Wiles is back in the office next week and he can access the computer remotely to take a look. No problem. This may be due to a bit depth problem as Yuri mentioned, specifically to do with if you capture images in 14bit. First, you should note that there is no such thing as a 14bit image file format. Images are typically saved in 8, 12 or 16bit. This means that if you have a 14bit image you must save it in a 16bit file format, which means that the highest intensity from the image will only be 1/4 of the total intensity range of the file. If you capture and save your images in 8 bit, or 24bit colour you shouldn't get this issue. Hi. I am using the Image Pro Insight and I am facing the same problem with Tiff., but when I change to 24 bit and save as jpeg. the images are not too dark. Unfortunately other problem arises, now when I am capturing images (untitled0, untitled1,etc.) when I try to save it the name of the capture image does not change, still untitled0, untitled1. What can cause this? In the folder the image is saved and with the proper name, but in the software not. 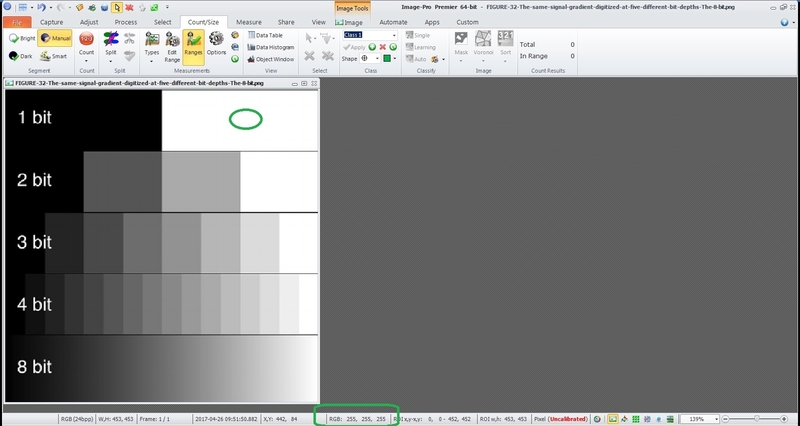 Have you compared the PIXEL VALUES in the same area of a DARK IMAGE and a NORMAL IMAGE to see if the DATA is the same and just the DISPLAY is different? Regarding the JPG IMAGE FILE SAVING . 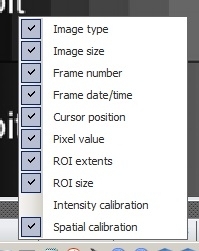 . .
"Calibration not being saved with TIF IMAGE in PREMIER 9.2 . . ."
It looks like the configuration of your PREMIER is not set to show the PIXEL VALUE that displays the INTENSITY VALUE under the MOUSE CURSOR. In the first image below, please see the MENU that is exposed with a RIGHT CLICK with the MOUSE positioned over the BOTTOM EDGE of the PREMIER WINDOW FRAME. In the second image below, please see the GREEN AREAS that illustrate the area of the MOUSE CURSOR (not captured by the WINDOWS PRINT SCREEN SCREEN CAPTURE) and the INTENSITY VALUE of the pixel(s) under the CURSOR. If in your situation with JPG and TIF images that seem to have different intensities, this should show you whether this is a VALUE ISSUE or a DISPLAY ISSUE. I believe you have discovered a bug in that version of Insight. The Lock control is not initializing properly under some conditions. One workaround is to toggle the Lock control in the Capture Controls section by selecting another value, then select Locked. This bug has been corrected in the latest version of Insight if upgrading is an option. Regarding the naming of captured images, it appears the feature is turned off. Please try clicking the Auto name captured images checkbox to enable it and see if it corrects the issue.